BMU has been founded by the promoters of The Hero Group with a vision to promote academic excellence in the areas of engineering and management. 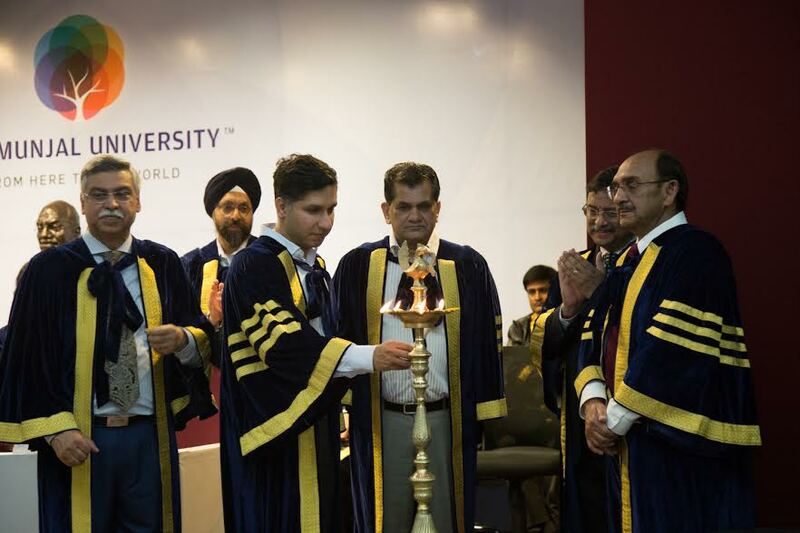 Dr. Sunil Kant Munjal, Chancellor of the University, conferred degrees on University’s second batch of students. Addressing the gathering Dr. B S Satyanarayana, Vice-Chancellor of BML Munjal University said, “This is a proud moment for us. This batch that is passing out today is ready for the next-generation opportunity that our nation is enabling. I convey my heartiest congratulations to all students for successfully completing their degree, programmes and to their learned teachers who have worked hard to enrich the young minds with quality education, knowledge, skills and moral values”. Giving the vote of thanks and encouraging the graduating students to reach for the stars, Mr. Akshay Munjal, President of BML Munjal University said, “This is a very memorable day for everyone at BMU as our second batch of MBA and the first batch of BBA students are graduating today. I convey deep regard and heartiest thanks to Mr Amitabh Kant. I wish all the students best of luck and thank you”. BMU is distinct in its unique curriculum and pedagogy, which is exemplified by up to 45% practical hands-on learning component in its programmes. Collaborations with renowned universities such as Imperial College London (which is BMU’s academic mentor), Singapore Management University, Robert H. Smith School of Business, University of Maryland (USA), and corporates such as Axis Bank, Intel, IBM, KPMG, Siemens and Shell have allowed students to get a perspective on global trends in education and the contemporary professional world. The University believes in providing a supportive and nurturing environment which enables students to make the most of the opportunities it offers. An active campus life, multi-cuisine dining facilities, supportive faculty members and staff on campus, and a vibrant and diverse peer group ensure everyone has the opportunity to grow as well as contribute to the University space. With strong academic and industry collaborations and focus on hands-on and inter-disciplinary learning, BMU is one of the few universities to offer specialised programmes in keeping with current industry requirements. The University focuses on inter-disciplinary learning, R&D, and innovation, along with specialised courses in Engineering, Data Analytics & Forensic Accounting.